The holiday season can cause an array of mixed emotions for many. For some, it’s joy and excitement. For others, it’s anger, anxiety, and stress. If you tend to experience the latter, here are a few exercises you can practice on and off of your yoga mat to cultivate a state of being that is more balanced, perhaps even more optimistic. Dirga Pranayama is called the three part breath because you are actively breathing into three parts of your abdomen with intention. This breathing exercise is great for promoting full and complete breathing, supplying oxygen to the bloodstream, calming the body and mind, reducing stress and anxiety, and relaxing muscular tension. The best thing about it, is you can practice it anywhere! If things get to tense at your holiday dinner, Dirga has got your back! Think of your inhales and exhales being divided into 3 sections, each section filling a different section of your body. Allow your inhale to first fill your low belly, then your low chest, and then your upper chest/low throat. Allow your exhale to be released through your nose. If this makes you feel more anxious, exhaling through the mouth is okay. Exhale will first release from your upper chest/low throat, then move to your low chest, and finish in your low belly. Traditionally, savasana is used at the end of a yoga practice as a way to digest the energy cultivated during one’s yoga practice. Savasana is also a great way to release stress, fatigue, depression and tension. Adding a blanket on top of the body is a great way to stimulate the deep pressure touch receptors throughout the body, which helps the body not only relax, but also feel secure, grounded, and safe. Lie flat on the floor in a quiet space. Allow your legs and feet to roll away from the midline of your body so that they can completely relax. Allow your arms to lie along side your body, leaving your palms open and facing upwards. 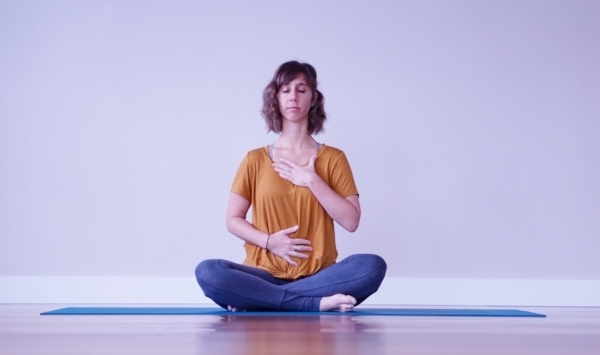 Utthita Tadasana is what is going to help you muster up self-confidence. This posture helps realign the spinal column, opens and energizes the entire body, and increases our self-confidence as the posture mimics the body language of powerful people. Stand with your feet wider than your shoulders. Toes facing forward and the outer edges of your feet parallel to one another. Open your arms wide and up, palms facing forward. Body will look like the letter X. Interested in learning more about how you can incorporate Ayurveda into your life and become the happiest and healthiest version of yourself?